Use simulation to estimate the probability of finding a saddle point in a random matrix. Use simulation to explore the distribution of the location of a saddle point in a random matrix. You might remember from multivariable calculus that a critical point (x0, y0) is a saddle point of a function f if it is a local minimum of the surface in one direction and a local maximum in another direction. The canonical example is f(x,y) = x2 - y2 at the point (x0, y0) = (0, 0). Along the horizontal line y=0, the point (0, 0) is a local minimum. Along the vertical line x=0, the point (0, 0) is a local maximum. The definition of a saddle point of a matrix is similar. For an n x p matrix M, the cell (i, j) is a saddle point of the matrix if M[i, j] is simultaneously the minimum value of the i_th row and the maximum value of the j_th column. 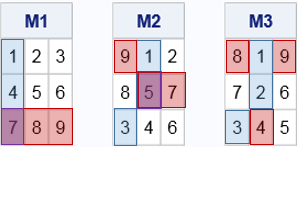 Consider the following 3 x 3 matrices. The minimum value for each row is highlighted in blue. The maximum value for each column is highlighted in red. Two of the matrices have saddle points, which are highlighted in purple. For the matrix M1, the (3, 1) cell is a saddle point because 7 is the smallest value in row 3 and the largest value in column 1. For the matrix M2, the (2, 2) cell is a saddle point because 5 is the smallest value in row 2 and the largest value in column 2. The matrix M3 does not have a saddle point. No cell is simultaneously the smallest value in its row and the largest value in its column. A function that computes the location of the saddle point follows. It uses the SUB2NDX function to convert subscripts to indices. The indices of the saddle points are shown for the three example matrices. The 7th element of the M1 matrix is a saddle point, which corresponds to the (3, 1) cell for a 3 x 3 matrix in row-major order. The 5th element (cell (2,2)) of the M2 matrix is a saddle point. The M3 matrix does not contain a saddle point. A matrix contains either zero or one saddle point. There is a theorem (Ord, 1979) that says that the probability of finding a saddle point in a random n x p matrix is (n! p!) / (n+p-1)! when the elements of the matrix are randomly chosen from any continuous probability distribution. Although the theorem holds for any continuous probability distribution, it suffices to prove it for the uniform distribution. Notice that the existence and location of a saddle point is invariant under any monotonic transformation because those transformations do not change the relative order of elements. In particular, if F is any probability distribution, the existence and location of the saddle point is invariant under the monotonic transformation F–1, which transforms the numbers into a sample from the uniform distribution. In fact, you can replace the number by their ranks, which converts the random matrix into a matrix of that contains the consecutive integers 1, 2, ..., np. Thus the previous integer matrices represent the ranks of a random matrix where the elements are drawn from any continuous distribution. As you can see, the computational enumeration shows that the probability of a saddle point is 0.3 for 3 x 3 matrices. This agrees with the theoretical formula (3! 3!) / 5! = 36 / 120 = 3/10. Of course, when n and p are larger it becomes infeasible to completely enumerate all n x p matrices. However, you can adopt a Monte Carlo approach: generate a large number of random matrices and compute the proportion which contains a saddle point. The following program simulates one million random 4 x 4 matrices from the uniform distribution and computes the proportion that has a saddle point. This is a Monte Carlo estimate of the true probability. 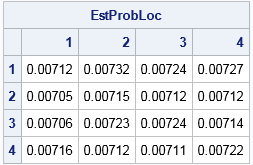 The output shows that the estimated probability agrees with the exact probability to four decimal places. The saddle point can occur in any cell in the matrix. Consider, for example, the integer matrix M1 from the earlier 3 x 3 example. If you swap the first and third rows of M1, you will obtain a new matrix that has a saddle point in the (1,1) cell. If you swap the second and third rows of M1, you obtain a saddle point in the (2,1) cell. Similarly, you can swap columns to move a saddle point to a different column. In general, you can move the saddle point to any cell in the matrix by a transposition of rows and columns. Thus each cell in the matrix has an equal probability of containing a saddle point, and the probability that the saddle point is in cell (i,j) is 1/(np) times to the probability that a saddle point exists. The output indicates that each cell has a probability that is estimated by 0.007 (the "James Bond" probability!). Theoretically, you can prove that the probability in each cell is given by the value of the complete beta function B(n, p), which for n=p=4 yields B(4,4) = 0.0071429 (Hofri, 2006). In summary, this article has explored three topics that are dear to my heart: probability, simulation, and properties of matrices. Along the way, we encountered factorials, permutations, the complete beta function, and got to write some fun SAS/IML programs. For more information about the probability of a saddle point in random matrices, see "The probability that a matrix has a saddle point" (Thorp, 1979) and and "On the distribution of a saddle point value in a random matrix" (Hofri, 2006). The post The probability of a saddle point in a matrix appeared first on The DO Loop.